Nations Arts Initiative and the Sports Medicine & Science Institute. 2006: Central New England United States Pony Club, Massachusetts. 2003: CSDEA Clinics & Year End Meeting - Minneapolis/St. Paul, MN. The Next level: Learning About Biomechanics by Kimberly Cruser. 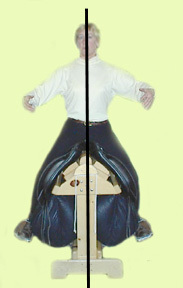 For those of us on the continuing search for improvements to our riding skills, the USDF University accredited lecture for members of the Ventura and Pomona CDS chapters in Dec 2000, was a great opportunity to learn more about the biomechanics of the human body and the muscle control and tone needed to ride well. 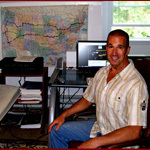 Article submitted to USDF Connection. "I am a middle-aged rider who has come back to riding after about 15 years. I have an 8-year-old Thoroughbred cross gelding that I work at First Level, hoping to do some showing eventually. I find I am not as flexible as I used to be and have recently heard about "biomechanics" and how it might help me. I'm not sure what is meant by the term as it refers to riding horses. Can you explain what it is and why it is important to dressage riders like me?" The science of classical ballet training, as used in Eastern Bloc development programs for gymnastics and figure skating, is the reference point for the optimization of fundamental movement mechanics and the precision execution classical dressage technique. 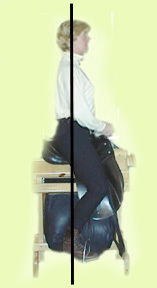 Inconjuction with a lecture presentation, individual consultations cover the rider specific mechanics of a connected seat, posting, halt/half halt, turn mechanics, spiral seat and lateral movements.